"In six months�in three, if she has a good ear and a quick tongue�I'll take her anywhere and I'll pass her off as anything. I'll make a queen of that barbarous wretch!" Most people remember and revere My Fair Lady for its the melodic score, captivating performances, witty script, and colorful sets and costumes. But few realize George Cukor's Oscar-winning adaptation of Lerner and Loewe's musical classic also stands as one of the greatest success stories in the field of film preservation and restoration. Faded, scratched, and almost crumbling after years of neglect, My Fair Lady presented a monumental challenge for Robert A. Harris and James C. Katz, who in the early 1990s undertook the arduous task of restoring the film to its former glory. Their efforts paid off handsomely and continue to reap huge dividends with Warner's new high-definition transfer. Consumers who purchased the first DVD edition of My Fair Lady will certainly want to discard that relic and spring for this beautifully packaged two-disc special edition, with enough enticing extras to make Henry Higgins cackle with glee. Much has been written about the controversial hiring of Hepburn, a non-singing actress, for such a major musical. And although dubber extraordinaire Marni Nixon (who also sang for Deborah Kerr in The King and I and Natalie Wood in West Side Story) eventually would be hired to record 95 percent of her vocals, Hepburn still turns in a spirited, passionate performance worthy of Oscar recognition. More dimensional than Higgins, Eliza brims with complexities, and Hepburn boldly depicts her inner struggles, yet shades her portrayal with a fragility and tenderness that is, at times, heartbreaking. As is mentioned on the disc's commentary track, Andrews' Cockney accent might have bested Audrey's, but nobody can play a princess like Hepburn, whom many still regard as Hollywood's most regal and glamorous star. Harrison, of course, so embodies Higgins, it's tough to tell where the character ends and the actor begins. Relishing every nasty putdown and thunderous rant, Harrison romps through the film with an infectious energy and debonair style that makes us somehow forget his character's cruel and exasperating nature. Like Eliza, we wind up embracing Higgins' faults and (almost) forgiving his shameless sexism. When he ultimately confesses I've Grown Accustomed to Her Face, the admission resonates like shockwaves from an earthquake, and we think maybe he's not such a hopeless case after all. 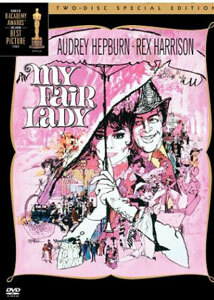 My Fair Lady, however, is so much more than Hepburn and Harrison. Cukor directs the feature in a Minnelli-esque fashion, with meticulous attention to color, set decoration, and costumes. (The eye-popping gowns and outrageous hats by Cecil Beaton adorn not just Hepburn but even the most remote extras, lending the production its inimitable sense of style and sophistication.) Always a champion of actors, he also draws marvelous work from such experienced pros as Stanley Holloway, Gladys Cooper, Wilfrid Hyde-White, and Theodore Bikel. Pacing can drag at times�an extraneous subplot involving Eliza's father easily could have been dropped if it didn't include two of Lerner and Loewe's best tunes�but, on the whole, Cukor keeps things moving while maintaining a frothy, ethereal feel that perfectly suits the material. This is big-budget moviemaking at its opulent best, and every penny is well spent. Finally, what would My Fair Lady be without its score? Wouldn't It Be Loverly?, I Could Have Danced All Night, On the Street Where You Live, Get Me to the Church on Time, Show Me, Just You Wait, With A Little Bit of Luck�so many immortal songs in one show, and almost all advance the plot or delineate vital character traits. It doesn't matter a whit who sings them; they're part of our musical heritage, just as My Fair Lady remains one of the last great musical achievements of modern cinema. And to think we almost lost it. Image Transfer Review: One word says it all�gorgeous. Warner has fashioned a high-definition transfer from the 1994 restoration that will knock your socks off, especially after seeing the film's reprehensible condition in the accompanying documentary. Colors leap off the screen with marvelous saturation (just look at the flowers in the opening title sequence), and the levels of detail and clarity are excellent. The lavish costumes look great throughout, but really take one's breath away during the racing scene at Ascot, where the black-and-white outfits provide stark, vivid contrast. Fleshtones are stable and true, and any digital doctoring escapes notice. A few specks and scratches still occasionally crop up, but given the film's history of neglect, it's easy to forgive such minor glitches. Without a doubt, My Fair Lady has never looked better, and you'll have to resist the temptation to eat this luscious transfer with a spoon. Bravo, Warner! Audio Transfer Review: Warner has remastered the audio to DD 5.1 and the results are outstanding. While ambient sounds remain almost nonexistent, the track enjoys superb fidelity and a richness of tone that effortlessly fills the room. A slight volume boost enhances the songs, which come through with crystal clarity and not a hint of distortion, even during Harrison's bombastic rants and Marni Nixon's high notes. Dialogue is always easy to understand throughout, and the subwoofer gets a nice workout with the pounding of horse hooves at Ascot. If only all musicals could sound this good. Extras Review: Nobody produces two-disc special editions with as much care as Warner, and the studio showers My Fair Lady with enough extras to flood the plains of Spain. In addition to the main feature, Disc 1 contains an interesting but strangely dry commentary track by art director Gene Allen, restorers Robert A. Harris and James C. Katz, and vocalist Marni Nixon (whose remarks were recorded separately and edited in). The bulk of the comments concentrate on the restoration, and the painstaking, expensive process of bringing the film back from the cinematic equivalent of the dead. The politics of film preservation is also discussed, as well as the differences between the old and new Hollywoods. Tucked into these topics are bits of trivia more conventional movie buffs will enjoy, such as the challenges posed by Harrison's primitive wireless microphone, and how Allen went all the way to London to choose wallpaper for the sets. Nixon appears only sporadically, and talks about the audition process and how she was "sworn to secrecy" once she was selected to dub Hepburn's vocals. She also addresses the difficulties of matching Hepburn's vocal tones and Cockney accent in the songs, and points out the instances where Hepburn's own voice was used in the film. Despite some good exchanges, the tech-heavy track rarely captivates, and will only appeal to the film's fiercest fans. Disc 2 houses the bulk of supplements, and begins with More Loverly Than Ever: My Fair Lady Then and Now, a marvelous 58-minute documentary chronicling the musical's evolution, transition from stage to screen, and meticulous restoration. Originally included on the film's 1994 VHS release and narrated by co-star Jeremy Brett, this in-depth examination seamlessly shifts between the history of the musical, production anecdotes, and the complicated technical process of rejuvenating My Fair Lady. Before-and-after examples show the film's wretched state and wondrous makeover, proving once again the vital, urgent nature of film preservation and restoration. The documentary drops in plenty of interesting tidbits, such as Rex Harrison's refusal to lip-sync to a recorded vocal track (he sang live instead), and how Audrey Hepburn performed to her own (ultimately unused) vocals, creating quite a dubbing challenge for Marni Nixon. We also learn about a breakdown of relations between director George Cukor and designer Cecil Beaton, and hear Julie Andrews' views on losing the role she created on Broadway. The Production section begins with more than 23 minutes of black-and-white footage from the 1963 Production Kickoff Dinner. After some silent clips of the dinner itself, interviews with Hepburn, Harrison, and studio chief Jack Warner follow, as well as excerpts from a press conference. A radiant Hepburn discusses how she trusts her artistic instincts when choosing a role, while Harrison charmingly (if testily) defends what the interviewer cites as his "difficult behavior" on the set of the then-forthcoming Cleopatra. Both actors (as well as Warner) talk about the differences between making movies in Europe and Hollywood (a hot-button issue at the time), and how finances and schedules are easier to monitor and control in California. Warner admits spiraling costs have made picture-making a greater challenge in 1963 than 25 years before, but that art must supercede business if a film is to succeed. Some of the footage is a bit scratchy and rough, some is out of sync at times, but it's a great historical document of a transitional period in Hollywood history. Up next is rare audio of George Cukor directing the Baroness Bina Rothschild in the ballroom scene. The two work intently on the delivery of a single line for almost two-and-a-half minutes, and the excerpt gives us a taste of Cukor's inimitable style. A number of color stills of Cukor directing various portions of the film run simultaneously with the clip. One of the most intriguing extras on the disc are full-length versions of the musical numbers Wouldn't It Be Loverly? and Show Me with Audrey Hepburn's original vocal tracks inserted. Seeing Hepburn perform to her own vocals definitely validates the decision to dub her. While far from "bad," Hepburn's tracks reveal an untrained voice with lots of character, but without the range and power necessary for Lerner and Loewe's score. High notes are quite thin and shaky, while Hepburn's overall style is too similar to Harrison's for comfort. In any event, the selections are fun to watch and analyze. The Show Me Galleries include nine beautiful color sketches, 70 black-and-white production stills (mostly costume tests), 52 color production stills, and 40 documents and publicity artifacts, including clippings, media photos, and album and video covers. In addition, a brief radio interview with Harrison, in which he praises the production and his leading lady, accompanies a one-minute montage of posters and lobby cards from the film. The Fairest Fair Lady is a studio-produced short that hypes the film while examining various stages of its production. The entertaining nine-and-a-half-minute featurette pays special attention to the extras and their grueling makeup and costume routine (an entire Warner soundstage was reserved for this assembly-line procedure), but we also glimpse the editor, cinematographer, and various members of the technical crew at work. Newsreel cameras captured the glitz and glamour of the Los Angeles premiere of My Fair Lady on October 28, 1964. Almost five minutes of footage chronicles the arrival of an impressive array of stars, including Rock Hudson, Maureen O'Hara, Angie Dickinson, Frank Sinatra and Natalie Wood (who came as a couple), Dean Martin, Steve McQueen, Lucille Ball, Fred MacMurray, Donna Reed, and James Stewart. The Awards section features a list of the bountiful honors My Fair Lady garnered, as well as Rex Harrison's Golden Globes acceptance speech (pre-recorded due to Harrison's film commitments in Europe), and a brief clip of studio chief Jack Warner accepting the Best Picture Oscar at the 37th Annual Academy Awards. The Comments section includes interview outtakes with director Martin Scorsese and composer Andrew Lloyd Webber from the More Loverly Than Ever documentary. Scorsese discusses film preservation and the establishment of the Film Foundation, while Webber recalls how illness forced Alan Jay Lerner to withdraw from their impending collaboration on Phantom of the Opera� one of the great disappointments of Webber's career. Both clips run just over a minute. Finally, the sumptuous supplements conclude with The Trailers of Lerner and Loewe, which presents previews for such musical classics as Brigadoon, Camelot, and Gigi, as well as trailers for both the initial release of My Fair Lady (running five minutes!) and its 1994 restoration (although the trailer included on the disc was produced for the film's 1970 reissue and has not been altered to mention the subsequent restoration). With this glorious two-disc special edition, Warner has made My Fair Lady fairer than ever. An impeccable transfer, top-notch audio, and a loverly spate of supplements make this classic musical (and Best Picture winner) a must-own for film buffs, videophiles, and anyone who enjoys great entertainment. Highly recommended.